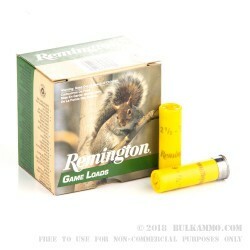 This is a case lot of 250 #6 lead based 20 gauge 2 ¾” shells. 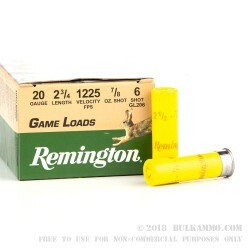 A fantastic moderate and small game load for the 20 gauge shotgun user, this is a perfect balance between the smaller shot you find in the “target loads” and the much too heavy shot found in turkey and moderate game loads. 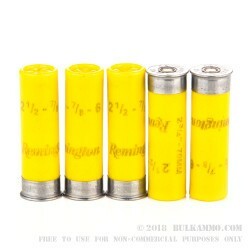 The balance of power and versatility makes this an ideal mid-range round to have on your shooting shelf with the nice quality build and the great #6 load that it offers, suitable for game of coyote size and smaller at moderate ranges. 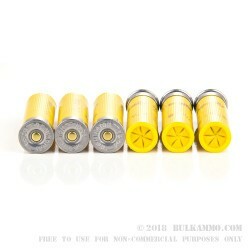 The general use case for these rounds will be at around 12 yards to 40 yards on game from ground squirrel up to coyote, though there are a few outliers this might make sense for, including fast ground birds and upland fowl. The moderate velocity and heavy payload for the 20 gauge platform makes sense for many animals in that size variability and the 1225 feet per second velocity will get you to them without much hesitation, allowing you more success in general hunts. The #6 shot has some benefits with its greater resistance to wind deflection and the heavy hitting potential of the lead-based round. This is not suitable for waterfowl or marshland/watershed use.